These hot knife Thermocutters feature an electrically (110V) heated blade designed for cutting all thermoplastics easily and effortlessly. Heats up instantly. Transformer steps voltage down to a safe level. 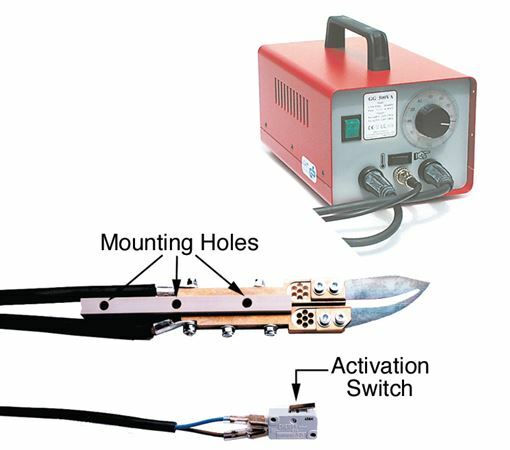 Cuts through material up to 5 inches thick.This hot knife Thermocutter is designed for continuous, industrial operation— including on-off batch production, use at a central work station or on-site. The ZETZ-25 can be set for on/off operation or continuous use with the flip of a switch. Our ZETZ-25 EOAT mountable handle is for automated applications such as robotic end-of-arm tooling or static mounted in-line cutting. Below is a demo reel showing the ZETZ-25 on a robotic arm.